Product prices and availability are accurate as of 2019-04-20 11:58:19 EDT and are subject to change. Any price and availability information displayed on http://www.amazon.com/ at the time of purchase will apply to the purchase of this product. An essential oil is a concentrated, volatile, aromatic liquid that is obtained from the fruits, seeds, flowers, bark, stems, roots, leaves or other parts of a plant. This is most commonly accomplished by steam distillation. Plant Therapy's standards of quality are some of the strictest in the industry. Before we sell an essential oil we do everything possible to establish that it is 100% pure, natural, AND of the highest quality. To ensure that each oil meets these strict standards, Plant Therapy works directly with world renowned essential oil expert, Robert Tisserand, and several analytical laboratories. What makes Plant Therapy the best essential oil company? The PEOPLE. The owners. The management team. The aromatherapist team. The customer service team. The warehouse team. And last but not least, the BEST customers. We go above and beyond just selling the highest quality essential oils. That is why we created the first ever full line of KidSafe® synergies. Formulated by Robert Tisserand, parents can know without a doubt that they are helping bless the lives of their children with the safest and most effective oils on the market for their young ones. 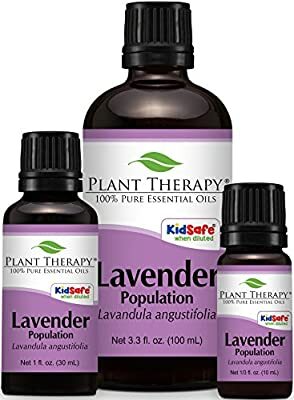 Botanical Name: Lavandula angustifolia Aromatic Scent: Lavender Essential Oil has a floral, herbaceous, fresh scent with balsamic woody undertone 100% Certified Pure Therapeutic Grade Essential Oil- no fillers, additives, bases or carriers added Have Questions? Message one of our Certified Aromatherapist through Amazon messages At Plant Therapy we also have some other selections you may be interested in. Includes: Basil, Bergamot, Cajeput, Carrot, Cedarwood, Chamomile, Cinnamon, Citronella, Clary Sage, Clove, Cypress, Eucalyptus, Fir, Frankincense, Garlic, Germanium, Ginger, Grapefruit, Helichrysum, Lavender, Lemon, Lime, Mandarin, Marjoram, Myrrh, Neroli, Naiouli, Nutmeg, Orange, Oregano, Patchouli, Peppermint, Pine, Rosemary, Spearmint, Tangerine, Tea Tree, Thyme, Vetiver, Vanilla, Wintergreen, Ylang Ylang.